I’ve been accused of ‘photoshopping’ the colors, and I’m sure many who know a thing or two about photography will claim excessive photoshopping when they come across pictures from the Namib-Naukfluft for the first time. 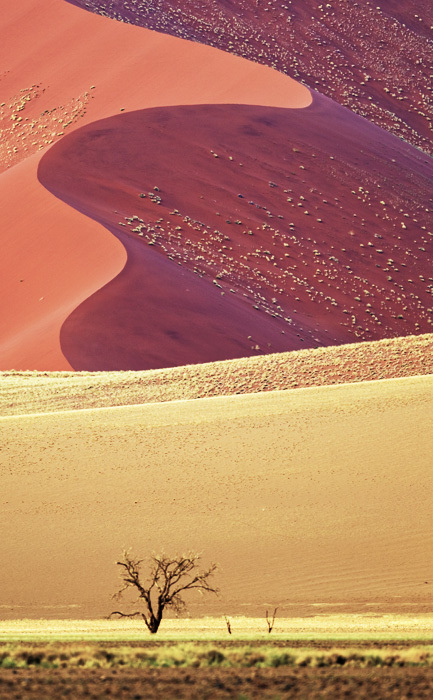 Before I went to Namibia for the first time, I refused to believe that the sand dunes near Sossusvlei can really be that red. And that big! The colors in the photographs that were shown to me were so unrealistic that I thought it was some of digital artwork rather than real photographs. I cannot blame others for thinking the same way. 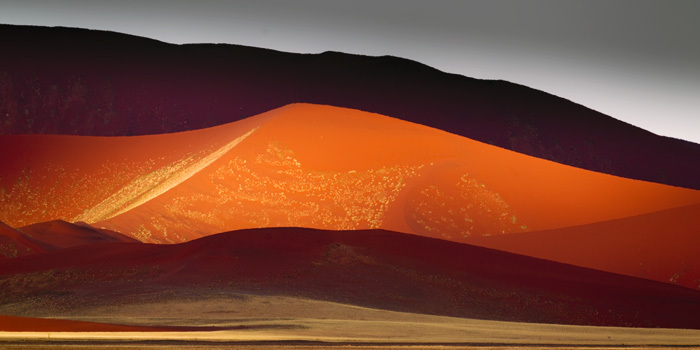 The Namib is a place that a person must visit to believe. The towering red dunes, flanked by younger yellow-brown dunes at their bases, in a narrow valley is a spectacular sight. It is a sight that wants you to put away your camera and just let your eyes feast on this ancient landscape — the Namib is regarded as the world’s oldest desert. The red sands are found only near Sossusvlei (as far as I know) and has a strange explanation. Apparently, the Orange river took (and continues to do so) the Kalahari desert sands into the south Atlantic, and strong winds blew the dust back inland to create the massive red dunes of the Kalahari. Unbelievable? Perhaps, but after seeing the Namib dunes for the first time, you’ll have doubts on what to believe and what not to believe! Older dunes are larger and red, younger dunes are yellow-brown. Cloudy days can create some unrealistic lighting. In this case, only the middle dunes are lit. 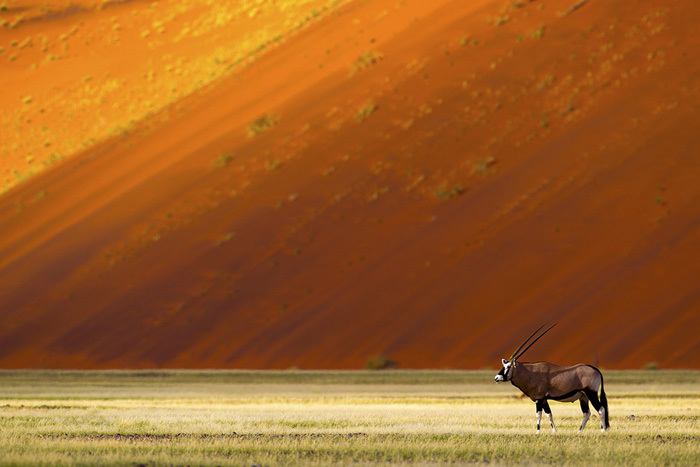 Gemsbok are iconic residents of the Namib. What amazingly hardy animals!